as Baja, California to establish the first permanent settlement in California. They built a mission named "San Diego de Alcala" and a Presidio military fort on a hill near a Native American village inhabited by descendants of the ancient Kumeyaay Indians. That hill is the present day location of "Presidio Park." A few years after the original mission was built it was moved a several miles inland to Mission Valley. The Presidio fort remained as protective security since the hill had a clear view of San Diego Bay where ship arrivals could be seen. With Mexico gaining its independence from Spain, all the land was relinquished to Mexico in 1821. Immigrating Mexicans created a community of adobe buildings at the base of the hill. This small community became what is known as Old Town San Diego. Old Town's Gradual Transition To The Next Era. Under control of Mexico, Old Town was given Pueblo status in 1834. It was the commercial hub of the area. 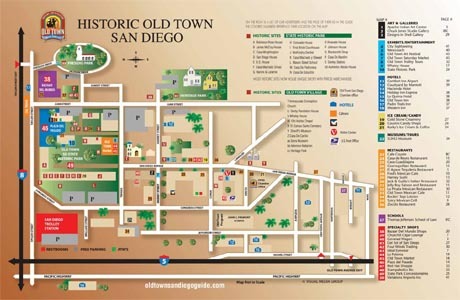 When California was admitted to the United States, Old Town was designated as county seat of San Diego County. In effect, it was the heart of San Diego in spite of a very small population that continued to dwindle. People started moving closer to San Diego Bay for the commercial advantages of being closer to navigable water. In the 1860s, a "New San Diego" was being developed by Alonzo Horton closer to the San Diego Bay. This new town would eventually become Downtown San Diego. Settlers and businesses flocked to the new town which quickly displaced Old Town as the new economic center of the San Diego area. In 1907, George Marston bought Presidio Hill where Old Town began, intending to develop it commercially. He was unable to raise the needed funding and instead made it a private park which became "Presidio Park." Today only small ruins remain of the original presidio fort. The Junipero Serra Museum was built in on the hill overlooking Old Town in1928 to house historical collections of the San Diego Historical Society. The museum is often mistaken for Serro's original mission built in 1769. When visiting San Diego, step back into history of Old Town San Diego. 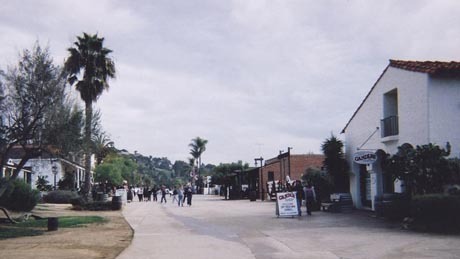 The State of California has designated the site below Presidio Hill as "Historic Old Town San Diego" to preserve the rich Spanish and Mexican heritage that characterized San Diego during the 1821 to 1872 period. Many of the buildings from that era still stand and new structures have since been built to house the amenities, theatres, artisans, art galleries, museums, boutique shops and restaurants which are all located within convenient walking distance. Preserved architecture and historic attractions in Old Town. The buildings include La Casa de Estudillo, La Casa de Altamirno Pedrorena, La Casa de Bandini, and the Mason Street School, San Diego’s first one room schoolhouse. Just up the hill from Old Town San Diego Historic State Park, you’ll find Heritage Park where several of Old San Diego’s most notable Victorian homes have been relocated and restored to their original splendor. A short walk down San Diego Avenue is the Whaley House, an officially designated haunted house, the Little Adobe Chapel on Conde Street, the first Church in Old Town San Diego and El Campo Santo on San Diego Avenue, an 1850 Catholic Cemetery. The historic flavor of Old Town has been preserved and protected and is a charming place to visit to connect with its rich historic past. You can tour the historic area on your own or take a free guided tour by the visitor's center. Old Town has become almost like a "theme park" that includes new buildings created to resemble architecture of the past that houses shops and restaurants. If you're driving. Take Interstate 5 north of downtown San Diego and exit at Old Town Avenue and follow the signs. Parking is free. Via Trolley. Both the San Diego Trolley and the Old Town Trolley Tours travel there, Visit their respective websites for locations and schedule.